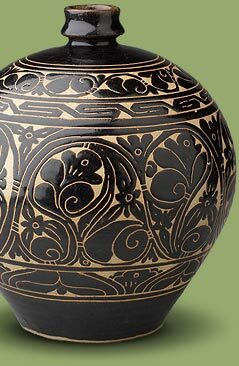 Tz'u-chou is a term used to classify a wide range of northern Chinese stonewares made principally in Hopeh, Honan, Shansi, and Shantung provinces between the Sung and Ming dynasties (960-1644). Tz'u-chou arose from the tradition of T'ang dynasty (618-906) white wares, but coarse local clays required the use of a creamy white slip to mask the dark color of the buff-grey body. This white slip is the distinguishing characteristic of Tz'u-chou ceramics which consisted primarily of inexpensive wares for everyday use. Most examples make some use of black-and-white decoration featuring floral designs. Using the white surface as a ground distinct from both the darker clay body and exterior clear glaze, Tz'u-chou potters developed an astonishing variety of decorative techniques, over twenty in all. Some basic methods included black-and-brown painting on white slip, white or black slip with deeply carved decoration that exposed the clay body (cut-glaze technique), black slip sgraffiato designs on white slip, incised and stamped decoration, green lead glaze, and the earliest use of enamel overglaze decoration. The success and longevity of Tz'u-chou wares can be attributed to their middle class popularity and regional economic base. Sturdily potted and utilitarian, they did not depend heavily upon court patronage or export revenues like other Chinese ceramic wares.